Patrick Jackson went to Stephen F. Austin in Nacodoches, Texas where he set receiving marks for the school. Playing in the shadow of many larger institutions including LSU, UT, and even A&M at the time, players from SFA really didn’t receive much attention coming out of college. He’d be a free agent signee of the Falcons in 1990, playing in the Red Gun offense, but he would not make the squad. 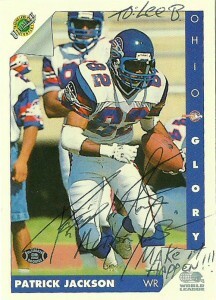 The Ohio Glory would take him during the 1992 WLAF draft and along with receivers Walter Wilson and Melvin Patterson they’d make one of the most prolific receiving corps in the league that season, despite being quarterbacked by the triumvirate of Babe Laufenberg, Glen Frey, and Pat O’Hara. Nicknamed “Action Jackson”, due in part to the movie with the similar title starring Carl Weathers, and a personal motto of “Make it happen,” Jackson would chip in 16 receptions for 167 yards that season, but his further football adventures would be derailed by an ankle injury and the end of the WLAF. reminisced about the Riders-Glory game from 1992 with the hail storm. With a few extra cards in the mail for him to keep, he kindly personalized one for me in 8 days and also wrote me a really nice note and encouraging me to keep in touch.